Mitesh Badiani has placed over 3000 implants since 1999 and is multi-disciplined in the use of various dental implant systems. He is the clinical lead of six private practices. In 2015, Mitesh was awarded National Dentist of the Year at the Dental Awards and also Dentist of the Year at the Primary Care Awards for his clinical expertise, commitment to patient care and his dedication to teaching and mentoring colleagues around the country. Mitesh was recognised with a life-time achievement award in 2014 for his dedication and charity work with medically discharged Royal Marines. 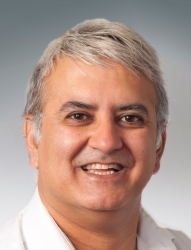 Dr Badiani has lectured widely throughout the UK and abroad on dental implant treatment and also provides a variety of postgraduate courses for dentists with a special interest in this field. Patients just beginning to think about dental implant treatment may find it helpful to attend a complimentary preliminary consultation with Dr Badiani. This appointment does not include a clinical examination and it only takes 15 minutes. The discussion will help you consider the options for treating your dental problems and decide whether to proceed to a clinical consultation for implants. The preliminary consultation is free of charge for visitors enquiring through this website. Please use the button in the right hand column to request an appointment. Once you have decided in principle that you want implant treatment, the next step is a clinical consultation. This includes a comprehensive oral examination, and results in production of a fully-costed individual plan for your treatment. The fee for the clinical assessment appointment and provision of your personal treatment plan is £80 inclusive of intraoral and OPT if taken on site. The cost of the treatment planning consultation is refunded when you proceed with the treatment. "I always recommend implants and, without hesitation, recommend your practice if they want a professional and first-class job done. You have given me back my confidence as I no longer need to hide my mouth behind my hand when talking. I now feel like a new woman, for which I thank you and all your staff"
The Practice is equipped with a Cone Beam CT Scanner which offers a wealth of 3D information and high definition imaging. The Practice has facilities for teaching and mentoring including the use of live surgery training via video link up from surgery to training room. Referrals can be made directly to the Practice via either telephone or post. Dr Badiani is available to travel to any Practice in UK to provide all of the above treatments and all materials, implants, equipment and nursing staff provided. Consultation and treatment planning support provided via internet and/ or telephone. Devon Dental Centre of Excellence is an established Private and Specialist Referral Dental Practice located in the beautiful setting of Devon amongst the Dartmoor landscapes. The practice is dedicated to the provision of exceptional quality private dental care and is committed to keeping abreast of the rapidly changing technology in today’s modern dentistry.